Free shipping on all VPR 4X4 products for lower 48 states. Accessories designed for high resistance and solid protection of your vehicle in the most difficult off-road obstacles. 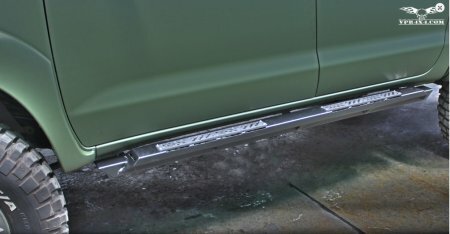 Our rock-sliders include a anti-slip surface in the access areas of the vehicle. The whole piece is chemically treated to increase resistance to rust, and two layers of powder coat are then applied to the product VPR4X4 Roof and Pick Up racks are designed and manufactured to enhance the vehicles lines. Among the key features is the ease of installation and of course the installation hardware is also provided.